The aim of this paper is to implement the new concept of cryptography. To protect information of files in digital form and how to get a security services by network security and cryptography. Though, a general summary of such algorithms like RSA, DES and AES of network security and cryptography is provided first. A complete review of the purposed system of network security and cryptography is then presented by using transmitter. The general attacks of security were reviewed. The purpose of this implementation is to secure a huge amount of files. So that others will unable to know the original data still they know about the procedure of encryption and decryption. This implementation has many applications to secure information including authentication. Here we create new technology by using such transmitter and receiver for decrypting data which is highly secure and accurate. Parul Rathor. "Accomplishment of Encryption Technique to Secure File." 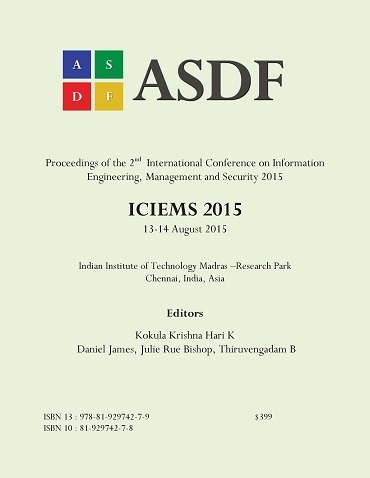 International Conference on Information Engineering, Management and Security (2015): 56-59. Print.